Alicia Reiss Masters is a fictional character appearing in American comic books published by Marvel Comics. She is usually depicted as a supporting character to the superheroes the Fantastic Four and Silver Surfer. Created by Stan Lee and Jack Kirby, she first appeared in The Fantastic Four #8 (Nov 1962). Alicia is a blind sculptor who is able to create incredibly lifelike representations of real people by touch and memory alone; her sculptures of the Fantastic Four and other superheroes are frequently depicted. A caring, sensitive character, she has been a romantic interest and confidante of The Thing, a member of the Fantastic Four who is frequently ashamed of his monstrous appearance. 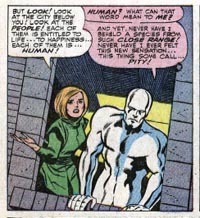 She has also helped explain human life and emotion to the alien Silver Surfer. Actress Kat Green played her in the unreleased The Fantastic Four film from 1994, and then Kerry Washington portrayed her in the 2005 film Fantastic Four and the 2007 sequel Fantastic Four: Rise of the Silver Surfer. The Thing (left) tries to rescue Alicia Masters on the cover to The Fantastic Four #66 (Sept 1967). Alicia is introduced in Fantastic Four #8, along with her stepfather, the supervillain known as the Puppet Master. She initially aids him out of obedience in his first scheme against the Fantastic Four, though she immediately senses the "gentle" and "sensitive" spirit of the Thing when she first feels his palpably monstrous face. Alicia turns on her stepfather when she realizes that he is mad and power-hungry, and accidentally causes him to fall to his apparent death out of a window. A subsequently published story explains that the Puppet Master had been responsible for her permanent blindness, which was caused by an explosion of radioactive clay during his fight with a rival. Alicia Masters pleads with the Silver Surfer for the survival of humanity in Fantastic Four #49 (April 1966). Art by Jack Kirby. Alicia Masters was a recurring character in early issues of Fantastic Four as the love interest of the Thing, serving as a plot device to cause him to resist changing back to a normal human form, for fear that Alicia would not love him as "plain Ben Grimm." The physically vulnerable Masters was also frequently used as a damsel in distress. The character plays an integral role in one of the most acclaimed comic book stories of the Silver Age, "The Coming of Galactus," in Fantastic Four #48–50 (March – May 1966). In that story arc, the Silver Surfer first comes to Earth as a herald to the powerful, world-destroying being Galactus, and crashes into Alicia's apartment after fighting the Fantastic Four. Her passionate pleading with him about the value of life convinces him to reject his master and defend the Earth from destruction. After the Thing chooses to remain on an alien planet where he could change back to human form, Alicia falls in love with the dashing Human Torch, another member of the Fantastic Four. The Thing returns to unhappily attend their wedding. In Fantastic Four #300, Johny Storm and Alicia have their wedding, but it is nearly foiled by the Mad Thinker, the Wizard, and Alicia's stepfather, the Puppet Master. These three villains planned to attack the wedding, but at the last moment Puppet Master stopped them, with the (unwilling) help of Dragon Man. After several months, the Fantastic Four discovers that Alicia was kidnapped and replaced by Lyja, a Skrull espionage agent sent to infiltrate the Fantastic Four and set them up for her handler, Paibok the Power Skrull, to destroy them. The Fantastic Four defeats Paibok and retrieves Alicia. She was taken before Ben broke up with her, and her feelings for Ben never changed. This makes things difficult for both him and Johnny. The two of them had months to resolve things between them. Now Johnny has to come to grips with the fact that the real Alicia never loved him and that Lyja is the woman he loves. Ben has to deal with having gotten over Alicia, only to have her back and in love with him. With her relationships with Ben and Johnny now complicated by Johnny's marriage to 'Lyja' and Ben's prior attempts to resolve his old feelings for her after Lyja's marriage, Alicia subsequently becomes romantically involved with the Silver Surfer and eventually leaves Earth with him, traveling through outer space at his side in an armored suit. Alicia is frequently trusted as a babysitter for Franklin Richards, the son of Invisible Woman and Mr. Fantastic. During the year-long period in which the FF were missing ("Heroes Reborn"), Alicia is seen as his primary caretaker. In a 2007 storyline set in the aftermath of an apparent assassination of Captain America, Alicia designed the memorial to him. Following the events of the 2008 "Secret Invasion" storyline, Alicia is made part of a support group for people replaced by the Skrulls, as she has firsthand knowledge of what it is like being replaced and then returned after a long period of time. After the Fantastic Four have disbanded following the collapse of the multiverse, Peter Parker purchases the Baxter Building to keep it safe until the team are ready to come back together, including a statue of the FF in the entrance hall that was made by Alicia. Ben initially spends some time with the Guardians of the Galaxy, but eventually, after a failed attempt to find the Richards' family in the multiverse, he proposes to Alicia just before the Richards return to Earth. The two marry just as Galactus returns to Earth in Latveria, but Reed reveals that he has actually developed a pocket temporal generator that freezes time everywhere on Earth but a small bubble for four minutes, allowing the rabbi to complete the ceremony and marry Ben and Alicia before they depart to fight Galactus. In the alternate future of the 1999 miniseries Earth X, Alicia has married Ben Grimm. They have two children, Buzz and Chuck, who have Ben's orange-rock skin. Like most of humanity, Alicia has been granted powers due to the release of a mutative agent. In the 2005 storyline "House of M", Alicia is part of the human resistance, struggling against the ruling class of mutants. She has spent some time as a sculptor, J. Jonah Jameson had commissioned one of himself for his home. In the 2007 miniseries Fantastic Four: The End, which depicts a possible future of the Fantastic Four, Alicia is married to Ben Grimm and they have three children and live on Mars, where she uses her sculpture talents for terraforming. The Ultimate Marvel version of the character is introduced into the modern revamp of the Fantastic Four, Ultimate Fantastic Four, in issue #29, where she is a sculpture student at an arts college. She finds a depressed Ben in the park; her simple gesture of friendship instantly places her in mortal danger from Doctor Doom. In A.I.M. 's pocket dimension of Earth-13584, it is mentioned that Alicia Masters is dead. Thing even mistook Moonstone for Alicia at the time when the Dark Avengers were drawn into this pocket dimension. Alicia Masters and the Silver Surfer in the Marvel Action Hour episode, "The Silver Surfer & the Coming of Galactus". Alicia made her animated debut in the 1982 Incredible Hulk series. She appears in the episode "Bruce Banner: Unmasked" where her stepfather gets control of the residents in Metro City, as well as The Hulk. She is the only person of whom he does not make a puppet and assists the Hulk in defeating him. Alicia Masters was a regular character in the 1994-1996 Fantastic Four animated series voiced by Pauline Arthur Lomas. In Fantastic Four: World's Greatest Heroes, Alicia is portrayed as an African-American woman and voiced by Sunita Prasad, keeping some level of visual continuity with the feature film. Alicia Masters appears in The Super Hero Squad Show episode "Blind Rage Knows No Color" voiced by Tara Strong. In the unreleased 1994 film The Fantastic Four, Alicia Masters first live-action appearance was played by Kat Green. Alicia appears in the 2005 film Fantastic Four, where she is played by Kerry Washington. She becomes the love interest of Ben Grimm after the latter's fiancée leaves him following his mutation into the Thing. In a scene in Alicia's studio, Ben notes a number of puppets on the wall, which she says belong to her "stepfather". Washington reprised the role in the 2007 sequel, Fantastic Four: Rise of the Silver Surfer. She serves as Sue Storm's maid of honor. According to Michael Chiklis, Masters and Grimm's relationship would have had a greater focus in the cancelled third installment of the Fantastic Four film series. The character appears in the game based on the movie, voiced by Cree Summer. In the story, the Thing and Mr. Fantastic must rescue her from the Mole Man's minions. On one level of the game, her stepfather, the Puppet Master, brings Egyptian and prehistoric museum exhibits to life to attack the Fantastic Four, as he feels that association with the Thing will be dangerous for Alicia. ^ Sanderson, Peter (2007). The Marvel Comics Guide to New York City. New York City: Pocket Books. p. 11. ISBN 1-4165-3141-6. ^ Fantastic Four #25 (April 1964), p.2. Marvel Comics. ^ Cronin, Brian (February 19, 2010). "A Year of Cool Comics – Day 50". Comic Book Resources CSBG Archive. Retrieved September 29, 2010. ^ "Dearly Beloved," by Roger Stern, John Buscema, and Sal Buscema. Fantastic Four #300 (March 1987). Marvel Comics. ^ Thunderbolts #2. Marvel Comics. ^ Loeb, Jeph (w). Fallen Son: The Death of Captain America #5 (July 2007), p. 3. Marvel Comics. ^ Avengers: The Initiative #20. Marvel Comics. ^ Universe X #1–14 (2000–2001). Marvel Comics. ^ Spider-Man: House of M #3 (2005). Marvel Comics. ^ Fantastic Four: The End #1–4 (2007). Marvel Comics. ^ Ultimate Fantastic Four #29 (2005). Marvel Comics. Alicia Masters at the Grand Comics Database. The Beyonders are a fictional enigmatic higher-dimensional race appearing in American comic books published by Marvel Comics. Fantastic Four, also known as Fantastic Four: The Animated Series, is the third animated television series based on Marvel's comic book series of the same name. Airing began on September 24, 1994, until ending on February 24, 1996. The series ran for two seasons, with 13 episodes per season, making 26 episodes in total. Fantastic Four (stylized as Fantastic 4) is a 2005 superhero film based on the Marvel Comics team of the same name. It was directed by Tim Story, and released by 20th Century Fox. The film stars Ioan Gruffudd, Jessica Alba, Chris Evans, Michael Chiklis, Julian McMahon and Kerry Washington. This was the second live-action Fantastic Four film to be filmed. A previous attempt, titled The Fantastic Four, was a B-movie produced by Roger Corman that ultimately went unreleased. Fantastic Four was released in the United States on July 8, 2005. It received mixed reviews but was a commercial success. A sequel, Fantastic Four: Rise of the Silver Surfer, was released in 2007. A reboot was released in 2015. The Human Torch (Johnny Storm) is a fictional superhero appearing in American comic books published by Marvel Comics. The character is a founding member of the Fantastic Four. He is writer Stan Lee and artist Jack Kirby's reinvention of a similar, previous character, the android Human Torch of the same name and powers who was created in 1939 by writer-artist Carl Burgos for Marvel Comics' predecessor company, Timely Comics. Like the rest of the Fantastic Four, Jonathan "Johnny" Storm gained his powers on a spacecraft bombarded by cosmic rays. He can engulf his entire body in flames, fly, absorb fire harmlessly into his own body, and control any nearby fire by sheer force of will. "Flame on!" which the Torch customarily shouts when activating his full-body flame effect, has become his catchphrase. The youngest of the group, he is brash and impetuous in comparison to his reticent, overprotective and compassionate older sister, Susan Storm, his sensible brother-in-law, Reed Richards, and the grumbling Ben Grimm. In the early 1960s, he starred in a series of solo adventures, published in Strange Tales. Human Torch is also a friend and frequent ally of the superhero Spider-Man, who is approximately the same age. Jay Underwood played him in the unreleased 1994 film The Fantastic Four; Chris Evans portrayed him in the 2005 film Fantastic Four, and its 2007 sequel Fantastic Four: Rise of the Silver Surfer; and Michael B. Jordan portrayed him in the 2015 film Fantastic Four. Kat Green born as Kathryn Greenblatt is an American actress, composer, producer and writer. She's best known for being the first woman to play Marvel Comics' Alicia Masters in The Fantastic Four in 1994, directed by Oley Sassone and co-produced by Roger Corman. Kerry Marisa Washington (born January 31, 1977) is an American actress. From 2012 to 2018, Washington has gained wide public recognition for starring in the ABC drama Scandal, a Shonda Rhimes series in which she played Olivia Pope, a crisis management expert to politicians and power brokers in Washington, D.C., and also is a producer. For her role, she has been nominated twice for a Primetime Emmy Award for Outstanding Lead Actress in a Drama Series, Screen Actors Guild Award for Outstanding Performance by a Female Actor in a Drama Series, and a Golden Globe Award for Best Actress in a Television Series. Washington is also known for her roles as Della Bea Robinson, in the film Ray (2004), as Kay in The Last King of Scotland (2006), as Alicia Masters in the live-action Fantastic Four films of 2005 and 2007, and as Broomhilda von Shaft in Quentin Tarantino's Django Unchained (2012). She has also starred in the independent films Our Song (2000), The Dead Girl (2006), Mother and Child (2009) and Night Catches Us (2010). In 2016, she portrayed Anita Hill in the HBO television film Confirmation, for which she was nominated for a Primetime Emmy Award for Outstanding Lead Actress in a Limited Series or a Movie. In April 2014, Time magazine included Washington in its annual Time 100 list. Lyja is a fictional character appearing in American comic books published by Marvel Comics. A Skrull, she possesses the ability to shapeshift into almost any humanoid or animal form. Modifications on her body give her the power to generate energy blasts. The Puppet Master (real name Phillip Masters) is a fictional character and supervillain appearing in American comic books published by Marvel Comics. The Puppet Master uses radioactive clay to make puppets in the likenesses of real people, whom he can then control by attaching the clay puppets to strings and moving them about. Presumably he has some sort of psionic ability that enables him to do this. He has a deep hatred of the Thing, who is romantically interested in his stepdaughter, Alicia Masters. He once tried to take over the world but was thwarted in this effort by the Fantastic Four. Marvel Super Heroes Secret Wars, commonly known as Secret Wars, is a twelve-issue American comic book crossover limited series published from May 1984 to April 1985 by Marvel Comics. The series was written by Jim Shooter with art by Mike Zeck and Bob Layton. It was tied to the same-named toyline from Mattel. Spider-Man and the Fantastic Four is a four-issue comic book limited series published by Marvel Comics. It was published in May - August 2007, written by Jeff Parker and illustrated by Mike Wieringo shortly before his death. Sunita Prasad is a Canadian actress. She has appeared in television series such as iZombie, Bates Motel and UnREAL and also voiced Alicia Masters in Fantastic Four: World's Greatest Heroes. The Fantastic Four was an unreleased 1994 independent superhero film based on Marvel Comics' long-running comic book and features the origin of the Fantastic Four and the team's first battle with the evil Doctor Doom, combining the superteam's origin from The Fantastic Four #1 and Doom's origin from Fantastic Four Annual #2 with original elements. Executive produced by low-budget specialist Roger Corman and Bernd Eichinger (who went on to produce a big-budget Fantastic Four film in 2005), the film was ultimately never released officially, but illegal copies have began circulating after a few years. The Thing (Ben Grimm) is a fictional superhero appearing in American comic books published by Marvel Comics. The character is a founding member of the Fantastic Four. The Thing was created by writer-editor Stan Lee and artist Jack Kirby, and he first appeared in The Fantastic Four #1 (November 1961). The character is known for his trademark rocky appearance, sense of humor, and famous battle cry, "It's clobberin' time!" The Thing's speech patterns are loosely based on those of Jimmy Durante. Actor Michael Bailey Smith played Ben Grimm in The Fantastic Four film from 1994, Michael Chiklis portrayed the Thing in the 2005 film Fantastic Four and its 2007 sequel Fantastic Four: Rise of the Silver Surfer, while Jamie Bell acted the part in Fantastic Four (2015). In 2011, IGN ranked the Thing 18th in the "Top 100 Comic Book Heroes", and 23rd in their list of "The Top 50 Avengers" in 2012. The Thing was named Empire magazine's tenth of "The 50 Greatest Comic Book Characters" in 2008. The Wizard (Bentley Wittman), also known as the Wingless Wizard, is a fictional character, a supervillain appearing in American comic books published by Marvel Comics. He first appeared as an enemy for the Human Torch. Wyatt Wingfoot is a fictional supporting character appearing in American comic books published by Marvel Comics. While having no superpowers, he has spent much time in the company of the Fantastic Four due to his friendship with Human Torch, and his relationship with occasional Fantastic Four member She-Hulk. Wingfoot is an excellent athlete, marksman, hand-to-hand fighter, tracker and animal trainer, and has been of timely help in numerous potentially devastating situations.